Sitting down for several hours long each day may harm your overall health. 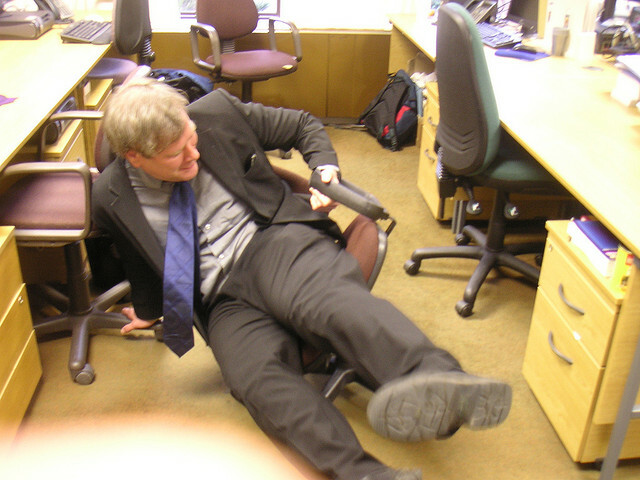 Avoid being sedentary in the office with these tips. Those who sit for long hours showed a 90% higher risk of developing diabetes than those who sat less, an 18% higher chance of dying of heart disease or cancer and 24% greater odds of dying from any other cause. The news is even surprisingly grim for those who exercise regularly—even if you exercise for 30 minutes to an hour each day, the study says, you aren’t undoing the harmful effects of your daily sitting routine. If you’re sitting too much each day, you're at risk for obesity, high blood pressure, diabetes, cancer, depression, and a whole host of health problems. While we're unlikely to see the surgeon general place a warning on chairs, some organizations are weighing in on the debate. Medical institutions around the world are enacting policies which encourage employers to find ways to break up sedentary time during the work day—especially since it might be the most dangerous thing employees do each day. With these undeniable health risks in mind, its integral for every business—not just large corporations with “wellness programs”—to look for ways to help combat employee sitting times and promote a healthier workplace (without the hefty price of treadmill desks, for example). A recent study from Employers reported that small companies are less likely than big ones to promote healthy workplace practices. There are several simple, cost-effective ways to incorporate more movement into your employees’ work days—all without interrupting their workflow. 1. Create your own standing workstation. Raise your work surface to the appropriate height for standing and use a stool when you need to sit. Ready to invest in an adjustable sit-stand product? Not every solution comes with a hefty price tag like those associated with trendy treadmill or bike desks. Find a sit-stand solution that works for you, and you may never go back. 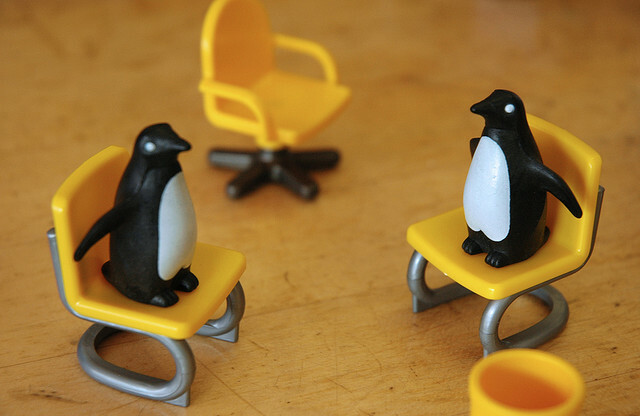 Stand up when answering the phone or if a coworker stops by your desk. Activities that don’t require the computer, like a group meeting or brainstorming session, are perfect to conduct on your feet. The benefits are clear—after a year of standing just three additional hours each day one can burn up to 30,000 extra calories and eight pounds of fat. That’s the equivalent of running about 10 marathons. Here’s an easy way to calculate the difference standing makes. Want extra credit? Incorporate isometrics, arm curls or banded leg exercises. 3. Stand up and stretch. It isn’t healthy to maintain a single posture for more than 30 minutes. When you feel yourself getting sleepy or your muscles stiffen (a sign that your metabolism is slowing down), it’s time to stand up. Follow these simple office stretches from the Mayo Clinic, or after working two hours, complete tasks that require movement, like filling up your water glass or collecting your mail. Take this workspace assessment to determine the ergonomic fitness of your workstation, then make adjustments to your chair, display mount, and keyboard tray. Regularly change the position of your display and keyboard to accommodate reflexive changes in your posture. 5. Stand with a buddy. Bold changes are easier to make when there’s a shared vision, so start a standing coalition among like-minded employees. Create a pact that no single coworker will ever be left standing by themselves. Implementing small changes is easy and has the potential for great results. Studies in office ergonomics show productivity increases 12% to 18% following an ergonomic intervention where employees are provided with well-designed ergonomic furniture. Sitting and standing as your body demands it is known to increase blood flow, metabolism, and caloric burn while improving focus, energy and productivity. From startups to Fortune500 companies, employees are every company’s best resource. Finding ways for them to move more throughout the day will not only aid in the development of healthier behaviors, but it can also have a major impact on employees’ engagement, satisfaction and morale at work. This culture enhances productivity, retention and can also be a great way to 'incentivize' employees.